It’s Hump Day: Wednesday, May 30, 2018: National Mint Julep Day. It’s also Indian Arrival Day in Trinidad and Tobago, which gave rise to the delicious and culturally appropriated Trinidadian roti. On May 30, 1943, Josef Mengele became the chief medical officer at the Romani section of Auschwitz. It is proof of the nonexistence of God that Mengele died in Brazil in 1979 (he had a stroke while swimming), never having come to justice. Finally, on this day in 1989, a 33-foot high “Goddess of Democracy” statue was unveiled in Tiananmen Square by protesting students (click on the link to see it). It was destroyed five days later by soldiers. Those who died on this day include Joan of Arc (1431; see above), Peter Paul Rubens (1640), Alexander Pope (1744), Voltaire (1778), Wilbur Wright (1912), Hermann Broch (1951), Boris Pasternak (1960), Leó Szilárd (1964), and Tex Beneke (2000). Meanwhile in Dobrzyn, Hili gives the answer which can never be given accurately. A: Hili, are you asleep? From Monika: why do snow leopards bite their tails. This tweet shows a whole thread of them. Are their tails tasty? A kangaroo can’t use a trampoline, FCS! Big fail: I think she tossed her cellphone to the birds! Salticid (jumping spider), also called, for obvious reasons, a “spider ant”. Look at those colors! Orsima ichneumon you are something else!!! This entry was written by whyevolutionistrue and posted on May 30, 2018 at 6:31 am and filed under Hili Dialogue. Bookmark the permalink. Follow any comments here with the RSS feed for this post. Both comments and trackbacks are currently closed. That stick insect – that seems to be fairly standard for the way they move. My guess is twofold – first, they look more like twigs blowing in the breeze. And second, the movement is disconcerting and vaguely threatening. Love the skier/waterskier, by the way. Also harder for a jumping spider to pin down? That was me tweeting the sheep! But I bet it’s no match that crazy jumping spider ant. I thought it would be akin to the way chameleons move–it allows them to see the environment from two different spots using only one eye, thus approximating binocular vision and distance perception. Except chameleons need the distance perception (I think) for aiming purposes, which may not apply to stick insects? An allusion to the Elia Kazan movie or the William Wordsworth poem? It looks like the guy’s aim is mighty good. He bullseyed the bowl. Trick shot artiste, just showin’ off. I tried and tried but couldn’t do it. That is because you’re not in a rotating space station. Here on Earth the trajectory would be more or less parabolic. Me: Hili, are you asleep? I put the English in; my mistake. Stand clear the birds, please. That video footage of Kilauea is spectacular! Incidentally, the close-in shots of lava erupting and splashing are curiously hard to ‘scale’. Very difficult to say whether the image is a foot across or a hundred feet. The “Cats” shirt looks to be a takeoff on this style jersey from your hometown Cubbies. I think it might be a jersey for the Forth Worth Cats, who existed in various incarnations as minor league and independent league teams (including as an affiliate of the Cubs for several years in the 1950’s and 60’s). I can’t find a jersey that matches the one Professor Coyne is wearing, though. There are also a bunch of other minor league teams with similar names – the Sacramento River Cats, the New Hampshire Fisher Cats, and the Carolina Mud Cats – so it could easily be one of those, as well. Vertically-driven curtain shutter, with the slit moving top to bottom (image is inverted inside the camera). Thanks; I’ve always wondered how that was done. Those sloping wheels were then used in cartoons to give an impression of speed. Nice video of Kilauea, actually referred to as the PUUOO eruptions that begin 35 years ago 1983. Hard to believe it has been that long as 1983 was the year I moved to Hawaii for a five year period. Made it over to the big Island once, maybe 85. At that time you could visit all the tourist areas around and on the mountain although there were a few closed roads. The Russian moggie with the moxie seems to make a habit of it. It staggers me how much information on the world there is in Google. 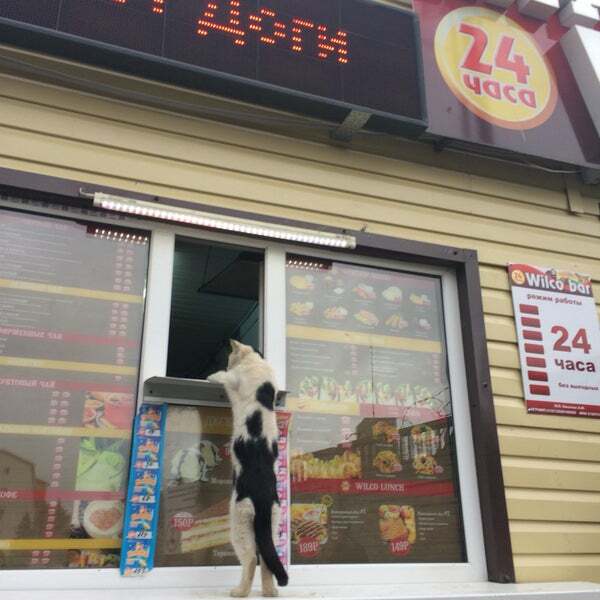 So if I ever make it to Cheboksary, I know where to eat! Now, are there any good reviews, before that? Looks like the Russian equivalent of all the “frites” stands here. Smith] cat is so similar to our mom-cat Sierra in her favorite feeding posture that I had to look twice to see if she’s been dining out. This one has a bob-tail though, while Sierra’s a rumpy-riser Manx. Still, how did you find it? Ray Harroun was a relative of my mine, through my grandfather. His Wasp was challenged before the race. Seems he was the only racer with a rear-view mirror rather than an observer. That saved about 150 pounds. The other racers felt he had an unfair advantage. But the organizers checked the rule book and found no rule prohibiting his choice. After the Indianapolis 500, many other drivers began using the rear-view mirror. Note: Ray did not invent the rear-view mirror, he just was an early adopter. In those days a car company started up for most race winners, so there was a Harroun car company until 1923. He was one of the very few drivers who actually ran the company and had input into the produced cars. Most drivers only endorsed cars in their name. Very interesting. I did not know they were called observers. Thought they were mechanics who could jump out if a minor breakdown occurred during the race. No helmets, no seat belts, none of that sissy safety stuff for those guys. I think they had multiple roles. One role was to report to the driver what was going on behind. They likely were mechanics too. Ray was versed in mechanics enough to do that himself as well. “Franco: And now my friend, the first-a rule of Italian driving. I have to say I feel for that poor woman who tossed her phone to the gulls, instead of her bagel. Sadly, that’s something I might do. There’s a Japanese-Caribbean place near Kingston that my sister took me to that carries the “make new stuff out of old” culturally-foodwise thing another step again. She lived when ordinary families were just beginning to experiment with surnames. Her father had toyed with Darc, which the Brits mistakenly believed to to D’Arc, thus dubbing her Joan of Arc, although there is no town in France called Arc. She always referred to herself as Joan the Maiden.